Christine Anne Perfect was born on 12 July 1943, in Bouth, Lancastershire, England, and is a singer, songwriter, and keyboardist, best known for being one of the lead vocalists of the rock band Fleetwood Mac. She has also released three solo albums, and all of her efforts have helped put her net worth to where it is today. 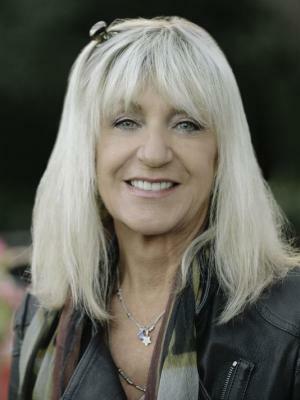 How rich is Christine McVie? As of mid-2016, sources estimate a net worth that is at $65 million, mostly earned through a successful career in the music industry. She has been inducted into the Rock ‘n’ Roll Hall of Fame, and has won numerous awards throughout her career. She’s also toured around the world, and all of these activities have ensured her wealth. Christine’s father was a concert violinist and her grandfather was an organist at Westminster Abbey. At the age of four, she learned to play the piano but she would not take music seriously until she was 11. She studied classical music for four years and then decided to focus on rock ‘n’ roll, influenced by artists such as The Everly Brothers. In college, she studied sculpture for five years, hoping to eventually teach art, but during this time, she met a few musicians who invited her to perform with a band called “Sounds of Blue”. After graduating from college, she moved to London, but had to work as a department store window dresser. In 1967, Christine’s former band mates Stan Webb and Andy Silvester formed the blues band Chicken Shack, and invited her to become the band’s pianist and to sing background vocals. They would go on and make two albums with the band, with most songs written by Christine, including the hit song “I’d Rather Go Blind” which featured her as a lead vocal. While a part of Chicken Shack, they would often meet with Fleetwood Mac, and soon Mick Fleetwod invited her to play piano for their second album “Mr. Wonderful”. She then became part of Fleetwood, after marrying bassist John McVie. She received a lot of praise for her musical skills and decided to release a solo album “Christine Perfect”, but she would become a vital member of Fleetwood Mac, and would join them in recording the album “Future Games”. They had difficulties during the early1970s which led to the band moving to the United States to have a fresh start. Stevie Nicks and Lindsey Buckingham joined the band after their move, and they released “Fleetwood Mac” which would go on and have multiple high-charting songs. In 1976, they released “Rumours” – categorised as one of the best albums of the rock era – but after the tour for the album, she and John divorced. Despite this, the two continued making music with the band, and reunited to record the album “Mirage”. She also recorded another solo album, but would continue to perform with Fleetwood Mac. In 1990, they released “Behind the Mask” and it would certify gold in the United States, and platinum in the UK. After her father’s death, she decided to retire from touring, but the band reunited in 1997 to release the album “The Dance”, which went to number 1 on the US charts. They toured once more and became part of the Rock ‘n’ Roll Hall of Fame. McVie then decided to return to England in 1998 and rarely appeared in public for a few years. She continued to support Fleetwood Mac, but would focus on a solo album called “In the Meantime”. She also appeared in various events, mostly to accept awards, and then in 2013 she performed with the Mick Fleetwood Blues Band in Hawaii. This led to a few performances with Fleetwood Mac and she would officially return to the band in 2014. For her personal life, it is known that Christine married John McVie in 1970 but they divorced six years later. In 1979, she dated Dennis Wilson of the Beach Boys but they also broke up after three years. In 1986, she married Eddy Quintela – who contributed to a lot of her songs – but they also divorced during the mid-1990s. 1 I thought the whole thing was really bizarre when I was asked to join. I had been a fan of Fleetwood Mac with Peter Green and guitarist Jeremy Spencer. On my nights off, I'd go to see Fleetwood Mac and ended up dating John. 2 [In 1990]: We'll never really stop playing with each other unless we really couldn't stand up anymore. We've barely scratched what we're capable of doing. 1 At a very early age, she learned how to play the cello from her father. She would also play that instrument in her school orchestra. 2 Rejoined Fleetwood Mac, after playing in Maui. .
3 Her birthplace, Greenodd, Lancashire, England, is 162 miles north of Birmingham, England, and nearly 85 miles west of Leeds, West Yorkshire, England. 4 Attended the Birmingham Institute of Art and Design, in Birmingham, England, where graduated with a teaching degree in sculpture. 5 Met future husband John McVie in the band "Chicken Shack.". 6 Had a house in Los Angeles, California. 7 Created the Fleetwood Mac art album of 'Kiln House.'. 8 Former girlfriend of Dennis Wilson (of 'The Beach Boys' fame). He would drown almost a year and a half later. 9 After quitting Fleetwood Mac, McVie had left Los Angeles to return to London, England, where she purchased a mansion in the countryside, to spend more time with her family, and her father, whom she lost in 1998. 10 Paste Magazine named McVie, together with Fleetwood Mac bandmates (Lindsey Buckingham and Stevie Nicks), as the 83rd greatest living songwriter or songwriting team. .
11 She was asked to do an Elvis Presley song, "Can't Help Falling In Love," for the movie A Fine Mess (1986), and she asked Richard Dashut to act as her producer. He, in turn, said Buckingham would probably love to help out, since he was a huge Elvis fan. She went on to recruit Mick Fleetwood and John McVie for her rhythm section, and 4/5 of the band found themselves together in the studio and actually enjoying it. 12 Once said in an interview, McVie is not listening much to pop music anymore and stated instead a preference for Classic FM. 13 Was awarded the British Academy of Songwriters, Composers and Authors' Gold Badge of Merit . 14 McVie was the youngest child of a middle-class family. 15 The only member of Fleetwood Mac who was raised in an out-right musical family where it was accepted--and almost expected-- to pursue a career in music. 16 Has a converted barn at her home in Wickhambreaux, Kent, England. 17 After her mother's Tee's death in 1970, her father, Cyril, remarried. 18 Left the band Chicken Shack to spend more time with her husband John McVie, she would later join Fleetwood Mac, full-time, after John talked her into replacing Peter Green, who left to pursue other interests. 19 Started singing when she was a little girl. 20 One of the lead vocalists of Fleetwood Mac, from 1970-1998, and came back since 2014. McVie is also the band's keyboardist. 21 Is very good friends with: George Harrison, Roger Daltrey, Pete Townshend, Tom Petty, Eric Clapton, Steven Tyler, Peter Green, Jeff Lynne, Joan Baez, Steve Winwood, Stevie Nicks, Mick Fleetwood and Lindsey Buckingham. 22 Her father, Cyril Perfect, was a college professor and concert violinist, and her mother, Beatrice (called Tee) Perfect, was a medium, a psychic and a faith healer. 23 Despite not being the founding member of Fleetwood Mac, she was the only member of this band to have written or co-written songs more than anyone else. McVie had written and sung 49 songs. 24 Before she was a successful singer and keyboardist (for Fleetwood Mac), she was once a member of the group Chicken Shack. 25 Was given lessons on the piano at the age of four, but her parents soon realized she was not enjoying it in the least. 26 The song that she wrote, "Don't Stop," was about her divorce from John McVie. 27 McVie was a devoted fan of Fleetwood Mac, and while touring with Chicken Shack, the two bands often would meet. They also were "label mates" at Blue Horizon, and Fleetwood Mac had asked McVie to play piano as a session musician for Peter Green's songs on the band's second album, Mr. Wonderful. 28 With former guitarist and vocalist Bob Welch's encouragement, Fleetwood Mac decided to move to Los Angeles, California. She was not too happy with this idea, as she loved the band's home, Benifold, and was very close to her family. 29 Had temporarily lived in an apartment in Malibu, California, right around the same time when Stevie Nicks and Lindsey Buckingham, joined her band, on New Years' Eve, 1974, at the time, they were boyfriend/girlfriend. Drummer Mick Fleetwood made sure McVie felt that she could get along with Stevie before hiring them; nobody wanted a situation where two women were bickering back and forth. 30 Before she was a successful singer and keyboardist, she used to work as a window dresser at a department store. 32 Her ex-husband John McVie is a cancer survivor. 33 She received the British Academy's Ivor Novello Award for Lifetime Achievement. .
34 Nephew of Dan Perfect. 35 Music ran in her family. 36 Her father, Cyril Perfect, passed away in 1998. 37 She is known to be a very private lady. 39 The oldest member of Fleetwood Mac. 40 Fleetwood Mac was awarded a Star on the Hollywood Walk of Fame for Recording at 6608 Hollywood Boulevard in Hollywood, California. 41 Announced her retirement from music when she married John McVie, but was coaxed out of it the next year by Fleetwood Mac, which up to that time had been an all-male band with a raunchy stage act. 42 Worked a little bit on Fleetwood Mac's 2003 album, but did not tour with them. Quit touring with Fleetwood Mac after "The Dance" tour in 1997. 44 Inducted into the Rock and Roll Hall of Fame in 1998 (as a member of Fleetwood Mac). Sound City 2013 Documentary writer: "Don't Stop", "Say You Love Me"
Glastonbury 2010 2010 TV Series writer: "The Chain"
Hi havia una vegada el disc de La Marató 2009 TV Movie documentary writer: "Tot passarà"
Peter Kay's Animated All Star Band: The Official BBC Children in Need Medley 2009 Video short writer: "Don't Stop"
Formula 1: BBC Sport 2009 TV Series writer: "The Chain"
Accepted 2006 writer: "Don't Stop"
Irresistible 2006 "Tell Me Lies"
Joe Somebody 2001 writer: "Songbird"
Mr. Music 1998 TV Movie writer: "Songbird"
Let It Be Me 1995 writer: "Everywhere"
The War Room 1993 Documentary writer: "Don't Stop Thinking About Tomorrow"
Women in Rock 1986 Video documentary lyrics: "Love Will Show Us How" / performer: "Love Will Show Us How"
A Fine Mess 1986 performer: "Can't Help Falling In Love"
Personal Best 1982 writer: "YOU MAKE LOVING FUN"
FM 1978 writer: "Don't Stop"
Slap Shot 1977 writer: "Say You Love Me"